Fish In Herb Sauce recipe by Nazia Nazar at PakiRecipes.com. This savory sauce is great over almost any kind of fish fillets. Turns a quick meal into a memorable one! 1 tsp. cornflour dissolved in 1 tbsp. water. Mix all the ingredients given under fish. Rub them well over the fish. Place in a dish in a single layer. Micro high uncovered 2 mins. Turn over fish with tongs or spoon. Again micro high uncovered 2 mins. Remove fish to a plate. 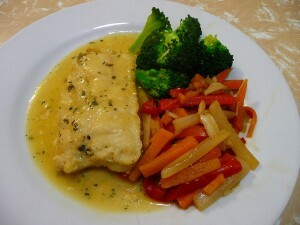 In the dish in which fish was cooked (there may be some juices present), add all ingredients under sauce ingredients. Mix well. Micro high uncovered 2 mins, stir once after 1 minute. Spoon this sauce over fish. Cover and micro high 2 mins.